So does couples counselling work? In this video I explore whether couples counselling works, how to make couples counselling successful if you decide to do it and why couples get stuck in couples counselling. Venue: The Affinity Centre, 29a Water Lane, Wilmslow, SK9 5AR. 10am – 4pm. In our increasingly mobile world, therapists are often called upon to address the needs of clients who have lived and worked overseas. Expatriate living impacts individuals on multiple levels therefore understanding the expatriate frame of reference is key to working successfully with this client population. Questions surrounding identity and belonging, feelings of restlessness and relational struggles are some of the challenges caused by the ever changing landscape associated with the expatriate lifestyle. In particular, repeated cycles of loss and grief are the most poignant issues facing expatriates today which can have a profound impact on well-being. Develop a deep understanding of the expatriate profile. Examine how key psychological and emotional aspects of expatriate living may impact individuals and families. Identify and understand factors that affect expatriate mental health and wellbeing. Build on therapeutic skills and introduce a variety of adapted and newly created interventions developed to serve the needs of this unique population. Kathy and Melissa are trained therapists, accredited by the BACP who have lived and worked extensively in expatriate communities. Kathy and Melissa have used their in-depth knowledge to guide professionals in how to work effectively with expatriates by adapting and devising therapeutic skills, theories and interventions to promote expatriate wellbeing. Their expatriate counselling courses will equip both the qualified counsellors who work with such clients and the supervisors who support them in their work, with the additional skills and expertise necessary to ensure the therapeutic experience is grounded in a deep understanding of this unique population. Participants must hold a recognised qualification in Counselling, Psychotherapy or related fields. This course is essential for those who wish to further develop their counselling repertoire for understanding and working with children, young people and adults from an expatriate perspective. Expatriate living impacts individuals on multiple levels therefore this course seeks to understand both the common and unique themes embedded in the expatriate experiences including: identity and belonging, restlessness, relational struggles, loss and grief. Through involvement in this course, you will gain a deeper insight into the lives of these unique individuals and, as a direct result will have a deeper knowledge to develop and employ effective interventions and support systems in order to inform practice in meeting the needs of the expatriate population. As the world becomes more global and more people are moving abroad for work and study, counsellors and psychotherapists are more likely to work with current or past expatriates. Without a solid knowledge of the issues confronting this unique population, their issues can be misunderstood and therapeutic work can be less effective. Examine how key psychological and emotional aspects of expatriate living impact individuals and families. Enhance skills that allow counsellors to provide appropriate care and responsiveness to expatriates. Improve expatriate engagement and investment in repatriation by developing strategies to support families through transition and beyond. Melissa Cochrane has over 16 years of experience in US and International education and counselling and psychotherapy. After qualifying as a teacher, she began her international career on the Japan Exchange and Teaching Program, then completed her Masters in Social Work with a Mental Health concentration at San Diego State University. She is a professional member of the American Counseling Association and is accredited by both the British Association for Counselling and Psychotherapy and the National Counselling Society in the UK. She has worked as a counselor in the US, UK, Romania, and Qatar. In 2014 Melissa founded Overseas Counseling and Psychotherapy Service, an online counseling and psychotherapy service for expatriates all over the world. She also sees clients privately in Wilmslow, UK. Kathy Swords has over 25 years experience in UK and International schools, formerly as a Teacher, a PSHE Specialist and subsequently as a School Counsellor. Kathy is accredited by the British Association for Counsellors and Psychotherapists. She practices from an Integrative perspective in order to meet the needs of this unique population. Kathy holds a Masters Degree and is currently undertaking her PhD at the University of Bath focusing on understanding and meeting the needs of expatriate children in UK boarding schools. In 2014 Kathy established the British Schools of the Middle East Counsellor’s Network and set up the first BSME Pastoral Care, Counselling and Safeguarding Conference. Kathy has two children who attended international schools, boarding schools and university as expatriate children. Acceptance Commitment Therapy (ACT) Personal Development Group. This is a 10 week, invite only, Thursday afternoon group starting on March 3rd 2016 at the Affinity Centre. 1.30pm – 3.30pm. Facilitated by the very experienced ACT therapist, trainer and supervisor, Ian Tomlinson and co-hosted by Bill Stevens, this group will provide an ACT consistent environment for individuals to bring about change. The work will be focused on moving towards a rich and meaningful life. Cost is £200.00 paid in advance for 20 hours of high quality personal development and change. There is education, experiential learning and homework! Please make payment in advance of March 1st 2016 by using the form below. Every invitee is familiar with personal development and struggles in one form or another, and is looking to bring their own agenda to the sessions, to work, learn, experience and be open to change. The Affinity Centre, 29a Water Lane, Wilmslow, Cheshire, SK9 5AR. Parking opposite in the multi storey. We are above Swinton Insurance (orange signage). There is a buzzer on the door. Multi Storey Car Park opposite side of the road. If that is full, then behind Hoopers there is a another public car park. Full location details can be found here. Gender identity does not start and finish with female and male, boy and girl or even man and woman. No, gender is an expression of who we are as a person in our environment and in the wider world. Generally speaking, our gender identity is assigned to us at birth and for most, this dovetails nicely with their sense of self. However, for some people the assigned gender does not always match how they see themselves in the world. For some it is a fluid state, where they express themselves as feminine and masculine, others it is a need to move from one fixed state to another. Wherever you are on the gender scale, not ‘fitting’ your assigned gender can be a lonely and emotionally painful experience. To experience the incongruence of being perceived as one gender and experiencing feeling of another can be difficult to explain. Talking to a counsellor can facilitate the process of self-discovery, who are you really, what are your actual needs and wants. Having the space to express how you feel, using the words that feel are right for you, can help you to untangle the confusion that can surround your gender identity. Counselling is a safe place where what you say is confidential and will not be judged and you will be treated with positive regard. Dealing with the realisation that you have a gender identity issue, working through your feelings. Accepting your gender identity, whatever it may be. Learning to live with the whole you, weather this means transitioning from one gender to another, or being fluid in your gender identities. Coming out, who are you coming out too and why? All of these and more can be difficult to navigate on your own, and trying to do so can cause mental health issues such as depression, anxiety, low self esteem. Accepting you need help can be daunting on its own, so once you realise that this is the case that you would like support, finding a counsellor who can truly understand and empathise with you is so important. 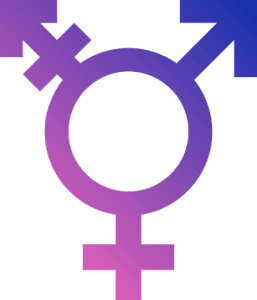 My experience of growing up with gender identity issues and finally realising I am transgender has given me a unique insight in to the feelings and emotions attached to gender related problems. I can understand the fear and the confusion, the dilemmas that we go through on our journey through life. Please, if you feel that I could be of help and support, please contact me and start/continue your journey to a more stable you.